The Danbury News Times and the other Hearst newspapers covered the story on February 1, here. The Manchester Journal Inquirer wrote about the unusual number of Barred Owls in its March 2 edition, here. Our story, below, was updated on February 3 to include further discussion among experts about why Barred Owl sightings seem to have increased this winter. Click here and see below. January 31, 2019 – We all know that owls are secretive and stealthy and, most of all, active in the dark, when you might hear them but rarely see them. But this winter seems different. Barred Owls have been making brazen, daylight appearances throughout Connecticut over the last few weeks. Bird experts have been watching in amazement – but not only bird experts. Connecticut residents who don’t normally think about the difference between a chickadee and a nuthatch have been gaping and gawking, snapping photos and taking videos and posting them to social media. Any one of these sightings might be dismissed as random. A Barred Owl roosted on a bird feeder one morning last week in Middletown, for example. A Barred Owl sat stop a tractor alongside a busy road one afternoon in Windsor. Several weeks ago, a Barred Owl snatched a rodent and ate it in a Farmington backyard as a family watched. Two appeared on different roadsides in Pomfret. A Barred Owl perched for 20 minutes on a garden gate one morning near the Connecticut-New York border. Ornithologist Chris Elphick, a professor at the University of Connecticut who is heading the Connecticut Bird Atlas Project, has seen six during the daytime over the past month, when he wasn’t even looking for them. The maps on Cornell University’s eBird.org, on which observers can pin the location of birds they see, sported 69 Barred Owl pins in Connecticut for the first three weeks of January. Compare that to 39 for all of January 2018, 40 for January 2017, and 32 for January 2016. 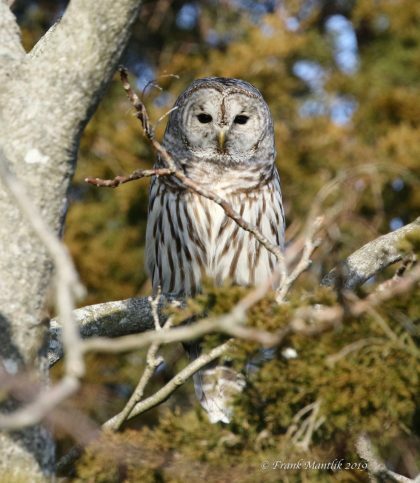 Known as birds of the inland woods that rarely show themselves along the coast of Long Island Sound, Barred Owls have turned up this month near the shore in Greenwich, Fairfield, Stratford, Milford, New Haven, Branford, Madison, Old Lyme, Groton, and Stonington. If you see an owl, revel in your good luck. But also please don’t approach it too closely. Click here for some common sense rules of owl-watching etiquette. It could be random. More likely, it adds up to Barred Owls being unusually abundant in the winter of 2018-19, resulting in close encounters with people throughout Connecticut. Patrick Comins, Connecticut Audubon’s executive director, and Milan Bull, senior director of science and conservation, think it’s the weather. They hypothesize that the rain and general dampness of last spring and summer created prime growing conditions for small mammals such as squirrels and mice, and for amphibians such as frogs and salamanders, all of which Barred Owls feast on. The abundance of food, they hypothesize, probably led to a highly successful 2018 breeding season for Barred Owls. Lots of baby owls hatched. 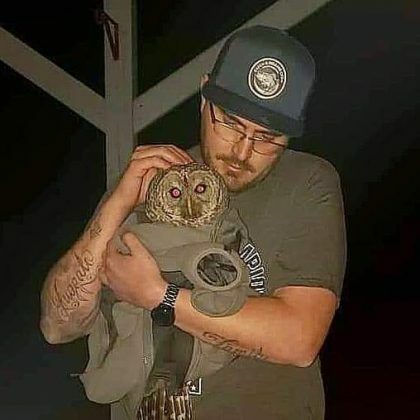 And now, as the 2019 breeding season approaches, those young owls are spreading across the landscape in hopes of establishing territories, which can encompass 600 acres or more. Soon their familiar “who-cooks-for-you, who-cooks-for-you-all” hoots will be heard throughout the state. Update, Sunday, February 3, 2019. Experienced and skilled wildlife observers have suggested alternative hypotheses in the days since we posted our Barred Owl article on Wednesday evening, January 30. There seems to be reason to think that contrary to what we speculated, Barred Owls are much more visible this winter because a drop in the rodent population has left them hungry and searching for food. Click here for more on the expert opinions of Scott Williams, Phd, of the Connecticut Agricultural Experiment Research Station; ornithologist and UConn Professor Chris Elphick, PhD; raptor researcher Larry Fischer; and licensed wildlife rahabilitators Dara Reid of Wildlife in Crisis in Weston and Horizon Wings in Ashford. Barred Owls are big and distinctive-looking – about 21 inches tall, with rounded heads and with breast feathers that form a pattern that looks somewhat like bars. Hence the name. They range throughout forested regions of North America and in general their population is increasing over the long term; the IUCN considers Barred Owls to be of least concern. Their surprising visibility this winter most likely means an even bigger, short-term increase, although it’s impossible to say how big the increase is or how many live in Connecticut. Elphick oversees the ongoing Connecticut Bird Atlas project, of which the Connecticut Audubon Society is a prime sponsor. 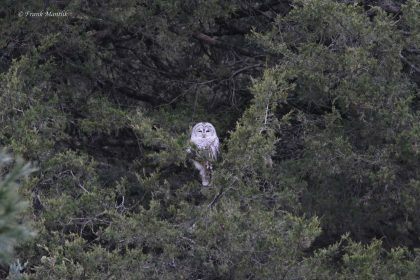 He urged people who see Barred Owls this winter to visit the Atlas website – www.ctbirdatlas.org – for information on how to record their sightings. While the owl boom has led to exciting opportunities to view these beautiful birds, it has also resulted in what seems to be an unusual number of Barred Owls being hit by cars as the birds swoop low across highways – for example in the Norwich area, along the Merritt and Wilbur Cross Parkways, and near Storrs, where people have been offering to submit owl carcasses to UConn for its collection. Wildlife rehabilitators have seen an increase. The Wildlife in Crisis center in Weston told us that 45 Barred Owls have brought in for treatment this winter. Horizon Wings Raptor Rehabilitation Center in Ashford told us their number was 25, including six being treated last weekend. Almost all of those are juveniles and almost all have been cared for and released back into the wild. If you have Barred Owl anecdotes or photos to share, take a look at our Facebook page. If you see a Barred Owl, enjoy the experience. But please stay far enough away that you don’t disturb the bird! Photo and video captions and credits, from top: Video courtesy of Heidi Voight, taken in Farmington. Chris Stone coddles at Barred Owl that was hit by a car in Northford. Barred Owl in New Canaan, by Frank Mantlik. 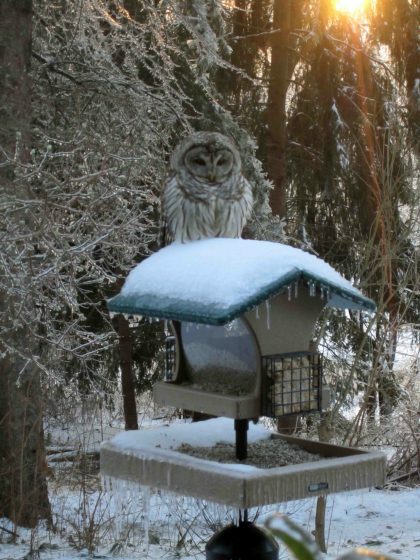 A Barred Owl perched on Jim Arrigoni’s bird feeder in Middletown. 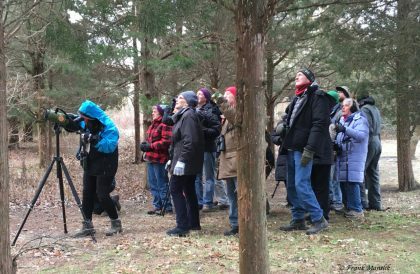 Birders looking for a Barred Owl at the Milford Point Coastal Center, by Frank Mantlik. 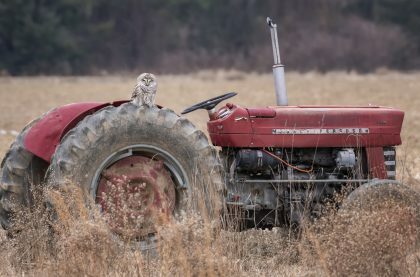 Brian Kulvete took a photo of a Barred Owl perching on a tractor in Windsor. Barred Owl in Milford, by Frank Mantlik. The owl leaps at around the 2:50 mark to capture a rodent. It finally eats the rodent at around 14:35 and then flies off about 15:10.